S-1110DP-M2SC05 10/100/1000Base Media and Rate Converter with PoE Power Sourcing. Dual 10/100/1000BASE-T (RJ-45) [100 m/328 ft.] to 1000BASE-SX 850nm multimode (SC) [550 m/1804 ft.] Includes AC Power Adapter. 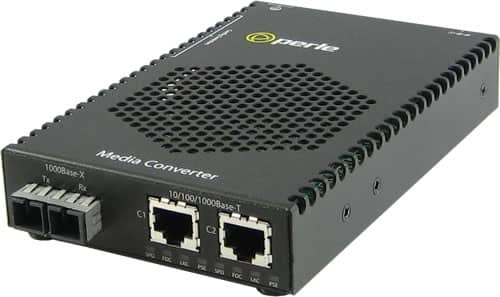 Fully compliant to IEEE 802.3, Perle PoE Media Converters are classified as Power Sourcing Equipment (PSE) classified as Power Sourcing Equipment (PSE) to provide up to 15.4 watts of power to PoE compliant devices such as IP cameras, VoIP phones and wireless access points. For complete product details and technical specifications, please visit our S-1110P 10/100/1000Base-T PoE Media Converter Product Page.